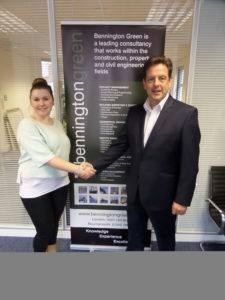 Bennington Green is delighted to support National Apprenticeship Week 2015. They currently have three apprenticeships running across their various offices, with plans to take on more apprentices in the future. Alice Wrate (pictured with Managing Director, Nigel Soloman) is based in Bennington Green’s Bournemouth head office and is currently studying Business Administration. The company have appointed out an outside approved trainer who visits the premises once a month to provide on the job training. This is the same process for Zita Nyaga who is also studying the same course, but based in the London office. In addition to the two business administration apprentices, Bennington Green have also taken on Rikki Stephens who is a trainee Building Surveyor in Bournemouth. His training is different as he will be attending university on weekly day release. Bennington Green has offices in Dorset, London, Essex and the Bahamas and in addition to taking on apprentices also encourage overseas visitors for internships and work experience. As one of the most recognized consultancy firms in Construction, Property and Civil Engineering in the South of England, Bennington Green offer an extensive range of services from all their offices and are happy to show students who are considering going down the Surveying or Civil Engineering route what it’s like. For more information please visit their website at www.benningtongreen.co.uk or telephone 01202 766584. You can also follow them on Twitter, LinkedIn and Facebook.